Dear friends,I'm writing from New York City, where the Occupy Wall Street movement is taking off. I'm writing from New York City, where the Occupy Wall Street movement is taking off. What started as a small group of young people with a vague call to action is evolving into something truly inspiring — and our crew at 350.org is excited to support this nascent movement. Let’s show the activists in New York (and in cities all over the country and the world) that the climate movement stands in solidarity with them. Share this image on Facebook, post it on Twitter, and consider joining a local “occupation” near you. Engage in dialogue and join the conversation that is shaping one of the most exciting grassroots movements in recent memory. It's hard to believe that just 10 days ago, I was in the afterglow of Moving Planet, sorting through inspirational photos from people all over the world who were moving beyond fossil fuels. The images were powerful, and they fired me up for whatever came next. What came next was the Occupy Wall Street movement. In the last two weeks it has grown from something small, local, and overlooked by the media into something massive, global, and unignorable. There are now non-violent protests springing up in hundreds of cities, and stories of "the 99%" are dominating headlines everywhere. No one knows exactly what it will become — but it has the potential to be a true game-changer. We now face exciting questions: what can we all do to support and expand this groundswell? 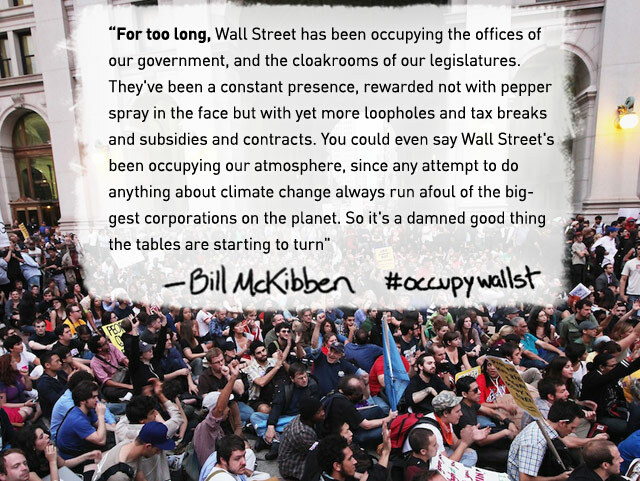 And how might Occupy Wall Street’s amazing energy further embolden the climate movement? The answers to these questions are starting to become clear. Two days ago I joined a crew of passionate climate activists in Manhattan to march with tens of thousands of people as part of Occupy Wall Street. The demands from the crowd were varied, but it all boils down to this: just about every problem we now face — from foreclosures to the climate crisis — is made worse by unchecked corporate greed and a corrupt political process. As I marched through the city, it struck me that naming (and acting on) the root causes of the world’s biggest problems is precisely what this moment demands. In the coming weeks, we’ll be zeroing in on the root causes of the climate crisis, and focusing on the iconic battles in the fight for our planet’s future. In the near term, we'll be focused on stopping the proposed Keystone XL tar sands pipeline–a key fight where corporate corruption and environmental justice collide. If we can stop the pipeline we’ll send a resounding message across the country: that it’s time for the health of our communities and our planet to come before the profits of Wall Street and big polluters. President Obama will decide by the end of the year on whether to approve the pipeline, and we’ll be scaling up our activism to keep the pressure on. From Wall Street to Washington DC to cities across the country, big things are coming together, and there are ways for people everywhere to join in. You can go to TarSandsAction.org to get plugged into the fight to stop the Keystone pipeline, and OccupyTogether.org to find out more about joining the 99%. The next phase of these movements will be a sprint, not a marathon. It's an honor to be running it with all of you. "The Cronyism Behind a Pipeline For Crude" – Bill McKibben's article in The New York Times"